The Trevi Fountain (Italian: Fontana di Trevi) is a fountain in the Trevi district in Rome, Italy, designed by Italian architect Nicola Salvi and completed by Pietro Bracci. Standing 26.3 metres (86 ft) high and 49.15 metres (161.3 ft) wide, it is the largest Baroque fountain in the city and one of the most famous fountains in the world. The fountain has appeared in several notable films, including Federico Fellini's La Dolce Vita. 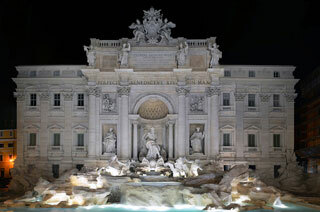 This article uses material from the Wikipedia article "Trevi Fountain", which is released under the Creative Commons Attribution-Share-Alike 3.0 License.